Back December of 2006 we wrote about Popeye's spin-off franchise, "Popeye's Louisiana Kitchen." 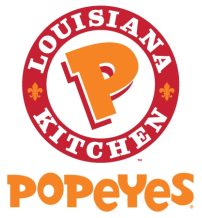 Now it seems that Popeye's is going to re-brand their primary franchise, "Popeye's Chicken and Biscuits" as "Popeye's Louisiana Kitchen." The "brand transformation" will include new menu items, national ads, and a new logo (pictured at right), in an effort to tie the brand to its Louisiana culinary traditions. buttermilk biscuit. They are each priced at $1.49.